TAG hear that Ramsbottom AD plant has been refused for being in the countryside, too close to homes, schools and potential for odours. Objectors are thrilled after many months of campaigning. The application by Peel and Tamar Energy was turned down last night at Bury Town Hall by the Planning Control Committee; despite the planner officer saying they were ‘mindful to approve’ last week. 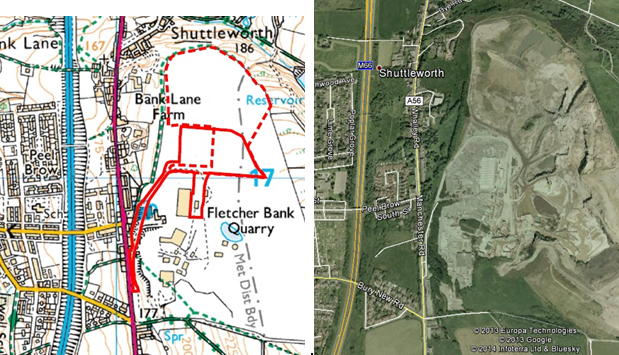 The proposal at Fletcher Bank was of a similar size to Twemlow (with plans to import 45,000 tonnes per annum of agricultural wastes and foodwaste, handled and stored inside a reception building) but the Twemlow site is even closer to homes. Before the meeting Ramsbottom councillor Ian Bevan said, “Members of the Public are allowed to attend the Planning meeting. Your Ramsbottom Councillors will be putting forward your views, urging them to reject the planning application. In addition, one representative of objectors can also speak for 3 minutes. Ramsbottom Against the Waste Site (“RAWS”) will deal with that. I would ask as many residents as possible to attend the meeting. Please be at the Town Hall for 6.30 pm on Tuesday 18th March with banners and placards showing your views so that we can try and convince the Councillors to refuse the application. Wasting food is the worst thing one would do, instead give it to needy!